This speaks volumes as to how fearful our political leaders have become now-a-days. And rightly so. They know the people are fed up with their wicked ways and so they repeatedly pass laws to try and cripple the common man's ability to speak out against them as is their constitutional right so as to protect their jobs. But have you noticed the progression of all this over the decades? At first, the mountains of red tape just to get a letter to a Senator seemed to work well, but then more and more laws were passed making protest 'somewhat' illegal on paper, and perfectly illegal on the street when the police were called in. And so, as I shared in a video years ago, free speech itself was targeted to the point "free speech zones" were set up so people can protest. Problem is, the area deemed "legal" was always acres to a mile or more away from the actual area where the leaders were meeting. That significantly crippled the free speech rights of all peaceful protests. One thing most are totally unaware of is, the removal of free speech started first with some fiery talking points of the Pope in Rome. Back in July of 2001 I did a Newsletter titled "Speaking against Vatican = Danger" which confirmed Rome was behind it all. Prophetic common sense dictates that they have to remove free speech to try and stop the present truth we share from getting out there. I also did a video on all this 3 years ago as well. Rome is pushing very hard here because she knows about the prophecy regarding the final message that exposes them globally. And now that it's getting very near the end, those under Rome's political thumb, and as I illustrated in my June of 1999 Newsletter, that's nearly every politician on earth and every CEO! Thing is, now that they must obey so as to stay in power and or business, they are actually showing signs of fear. Hence the reason for the fence around the Democratic National Convention. They know they must obey the Pope to stay in office as well as gain more power. But they also know the people don't like it. And so, instead of doing the right thing, they will do all they can to prevent the people from protesting anywhere near them while at the same time fashion some sort of security to make them feel safe. And no, this isn't just a Democratic issue. The Free speech zones actually came on the scene first when Republican president George W. Bush was irked at how protestors could be seen and heard by him as he traveled the country. A lot of people knew September 11 was an inside job and so he was one fearful man. This fear is also why Obama has such a huge entourage and his limo, affectionately called 'The Beast' is more like a tank than a car! 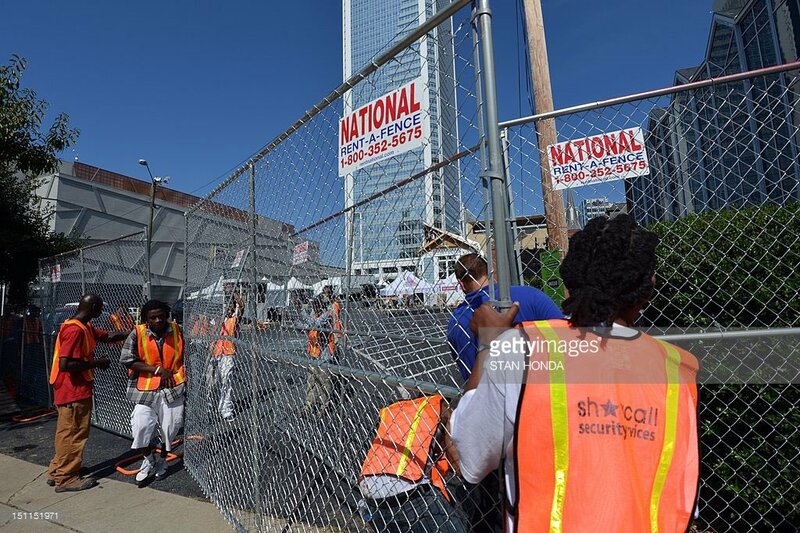 And now we see an 8 foot fence surrounding the DNC so as to keep the common man and protestors out. It appears the fear the Pharisees of old had of the people is still very much alive and well in today's world. Only problem is, today we have the means by which to censor just about every truth filled comment on and offline. Still.. even though Goliath likes to flex his muscles in front of puny little David, the loud cry will still go forth and those that need to hear the truth will hear it. As for the political leaders and judges that protect them from hearing the truth; yes, they may erect fences and even appoint free speech zones acres or even miles away from certain political events; and yes they may never see a letter or email you may send regarding the truth you want to share nor will they ever pick up the phone. No matter how much Satan tries to guard them from a thus saith the Lord, our God will make sure they too get an earful of truth. And how will He do that when they ignore the phone calls, emails and erect fences and designate free speech zones far from their location? Jesus Himself said in Luke 12:11-12 says, "And when they bring you unto the synagogues, and unto magistrates, and powers, take ye no thought how or what thing ye shall answer, or what ye shall say: For the Holy Ghost shall teach you in the same hour what ye ought to say."